Food is a important part of any travel experience, and one that I always look forward to investigating. Rather than seek out the fancy, five-star dining, I’m always looking for local cuisine. Not only is this simple food cheaper, it’s almost always better than the most fancy of restaurants. Jordan’s cuisine is different though, and I don’t think there’s a country that better matches my food palate than this one. First off, you have to like chickpeas. A lot. They’re in many common dishes, and being able to eat and enjoy them prepared in a dozen different ways, while not a prerequisite to travel in Jordan, is an important quality to possess. The bread in Jordan is plentiful, delectable and present at every meal. 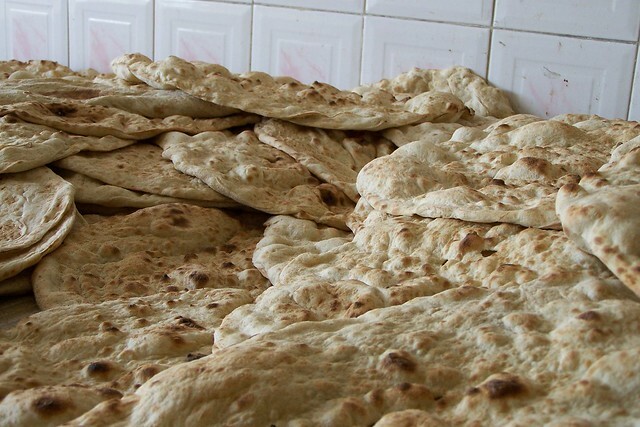 There are a variety of different Arabian bread types, the most common of which is a pita-style bread, but much larger than an American pita. They pita rounds are cooked fresh every day for the consumer and are pretty cheap – one round costs about $0.30. To give you an idea of how important bread is in Jordan though, it’s not sold by the round, it’s sold by the kilo. They mean business here. Not as common a bread type is one with which I fell madly in love, shraak. Shraak is a very thin, whole-wheat bread that is best enjoyed still hot. It’s easily made though, and is a common household meal accompaniment. Given it’s thin, pliable consistency, it’s the perfect bread to enjoy with hummus or ful. Breakfast overseas is a shock for many Americans, so used are we to a certain style and size of breakfast, but I quickly came to love the simpler Jordanian version. Breakfast varies, but the usual foods featured are: Fool(Ful), hummus, bread, white cheese, vegetables or maybe fruit. Fool was completely new to me, I had never heard of it nor eaten anything remotely similar, yet it’s found throughout Jordan. In it’s most basic form, fool is a hummus-style dip made from fava beans, which are mashed with oil, pepper, cumin and perhaps an onion. It’s also delicious, and I soon found myself lapping it up every morning with my freshly made bread. Lunch is the main meal of the day, but from my experience that didn’t mean dinner was that much smaller. There are countless options and delicacies found throughout the country, but I seemed to stay with a core staple of: falafel, omnipresent hummus, kabobs, chicken and lamb. These are just the basics, the one ingredient I haven’t mentioned is how generous Jordanians are, especially when it comes to food. I quickly learned that not only was I expected to eat a lot as the guest, but that saying no never ever worked, and usually just hurt someone’s feelings. Because my hosts were so eager for me to try as much as possible, this meant large meals accompanied by a series of snacks and a constant feeling of being full. Luckily, the food was so good and so fresh that it wasn’t hard to bring myself to acquiesce to another bite or two. One of the best food moments in Jordan was one of my first, at a traditional restaurant in Amman. The server brought out a stack of bread, naturally, and a series of small dishes including hummus, fool and a platter of small, freshly fried falafel. We sat there, not saying much, but instead feasting on the tasty morsels before us. As I popped in one last falafel, I was quickly advised that we weren’t done yet. It was time for dessert. I don’t have a lot of confidence in world deserts – they’re usually not very sweet and, in some cases, stray too far into the land of the savory for my taste. That’s why I was a little reluctant when we stopped for some knafeh. I carefully bit into the sweet cheese and doughy concoction, and it was instant love. It was warm, filling and just delicious. That was the only time I had truly great knafeh in Jordan, and I think about it a lot. I may have to return for that alone. I’ve had a lot of great food around the world, but never has a country’s cuisine been so uniformly appealing to me than that of Jordan’s. I think it’s my preference for simple, unfussy food that makes Jordan a perfect culinary match for me. Rather than add heaps of pointless vegetables or sides, the food speaks for itself. This is just a brief, not-at-all comprehensive look into the basics of Jordanian food. Over the coming weeks, I’ll be introducing specific foods and dishes, along with recipes, so everyone can enjoy the food for themselves. Looks and sounds delicious. I am the same, I always try to eat local food where ever I go. That hummus looks amazing! It puts the stuff we buy at the grocery store in the US to shame. Our cab driver bought us a knafeh on the way to Jerrash. We loved the food in Jordan. You can’t beat a bowl full of falafel and humus for 1 JD. I have no idea Jordan is really awesome for food! Thank you! Yes, I loved Jordanian food and you’re right, while some of it may bear similarities to other Arabic food, it definitely has its own twist. Thanks for the reminder of the great eats in Jordan! Can you tell me where you had the amazing looking knafeh? Our best memory was when we stopped in a small farming town in South Shuneh in the Jordan river valley for an impromptu lunch of steaming hot Mashowh pita bread and hot Falafel. Put a half dozen Falafel in the middle of this foot wide pita, fold it over, give it a smash, and you have the best lunch in Jordan…the best part was seeing the pita draped over the side of a pickup cooling. Check out my blog for a photo! Thanks! The knafeh came from Habibah‘s in Amman. LOVE Jordan, going back a t the end of the year…the food the people, incomparable.. Your description of Jordan’s culinary theater is a masterpiece. I certainly know what to expect once I visit there. Because of your very descriptive and precise analogy of the cuisine, I look forward to all of the culinary indulgences Jordan’s people have to offer.